Hi Heffydoodlers! 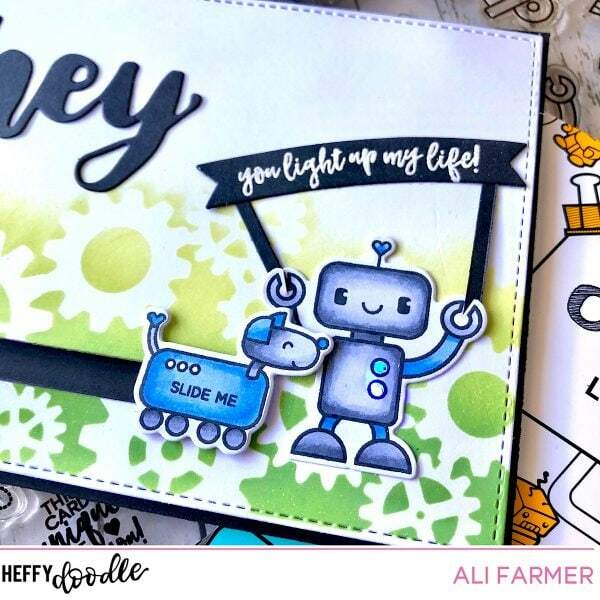 Ali here with this cute interactive card using Bots of Love and Bleep Boop stamp sets – along with the Chibitronics STEMstarter Kit. You have time to get your supplies together as Heffy Doodle and Chibitronics have an upcoming collaboration and the Heffy Doodle design team will have heaps on inspiration for you. So many of the Heffy Doodle sets can be used to create cool light-up cards using this simple circuit Kit. Hope this gets your creative juices flowing with ideas and that you will be ready for our collab! Keep reading for the video link and a chance to win!! My card with tutorial is up on the Heffy Doodle Youtube Channel now – with a chance to WIN too!! I have a Bleep Boop stamp set to give away to lone lucky commenter on the You tube video and my Instagram (@alilovescardmaking). Thanks for stopping by the blog and enjoy the video!